Upon arriving home from my trip and realized that Valentine's Day is this week! I dug my rosy pink blouse out of the closet and paired it with my best skirt for a little love-holiday spirit for work today. You may be wondering how I ended up on top of my radiator, and it all relates to my suitcase and laundry exploding all over my apartment. I wanted to take pictures and it was the only spot free of a mess, but I kind of liked hanging out beneath the twinkle lights with my feet toasty warm. I think that's a new great spot for outfit shots, nothing beats twinkle lights. 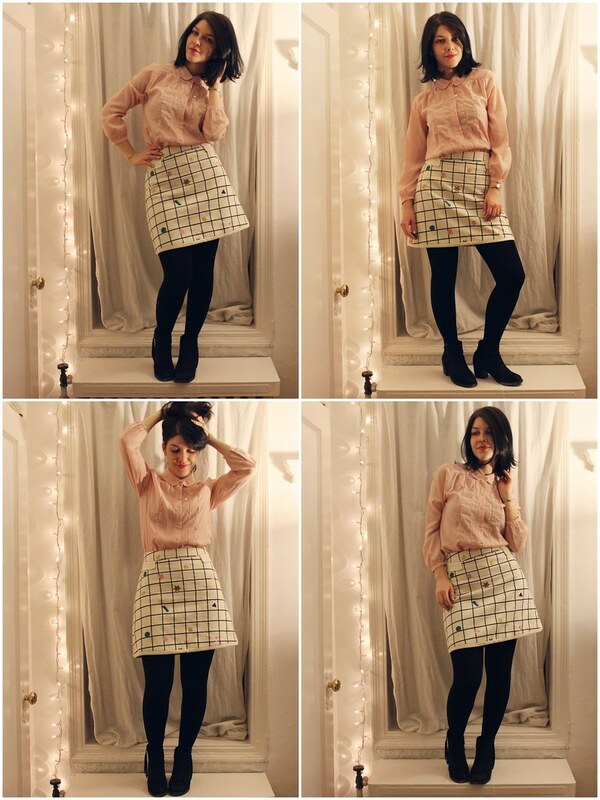 This is a really pretty outfit and I love the twinkle lights! I wouldn't have even known you were on top of your radiator, I just thought you had a floor-length window, haha! I love this outfit, the pastels are so pretty! This blouse is awesome! Such a pretty color and definitely perfect for a Valentine-inspired outfit. Great skirt too. The print is really cool.